Monster Hunter: World offers a rotation of temporary quests with some pretty great rewards but they tend to come and go quickly. 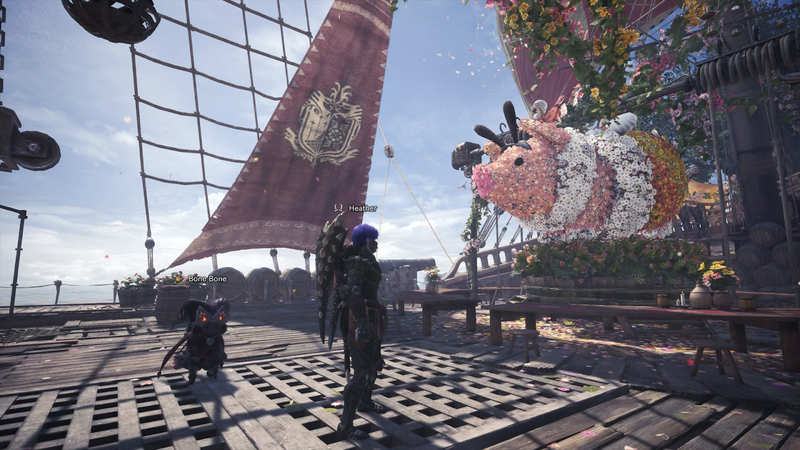 The game’s newest event, the Spring Blossom Festival, not only brings back old quests so players can get awesome loot but transforms the hub world into a bright garden full of special meals and giant floral poogies. Festival goers also get access to weekly bounties, which grant even more Spring Blossom Tickets. Between the bounties and the daily log-ins, getting all the new gear should be an easy process. In addition to the outfits, they’ll also get fireworks to set off in the field. The best thing about the Spring Blossom Festival is that it brings back nearly every unique event quest for about two weeks. This includes special promotional quests like those that granted Aloy’s outfit from Horizon: Zero Dawn or the absolutely ridiculous Ryu skin. The associated event quests remain limited to certain hunter ranks—something I’m not a fan of—but the renewed opportunity to gain special items helps the festival feel like a celebration. Players who might have felt punished for taking their time and hovering at a lower hunter rank or who had the misfortune of being too busy to log in for some quest now have a chance to get whatever they missed. New players who didn’t have the game when these events happen may also appreciate getting a crack at them. I expect an influx off wobbling wiggler hats and robotic palico cats in the coming weeks. Monster Hunter: World’s influx of special events over the last three months has led to smart quests that challenge hunters’ ability to fight off super-sized beasts and deadly monster combinations. The addition of a battle against Deviljho produced a particularly good hunt. The Spring Blossom Festival is a generous addition to the game that adds a feeling of celebration while also giving away a ton of loot. Also, the music in the gathering hall sounds like something from Skies of Arcadia, so this is automatically one of the greatest things ever.